Two of America's most popular SUVs earned performed badly in a crash test designed to show how well front-seat passengers are protected in a violent collision. 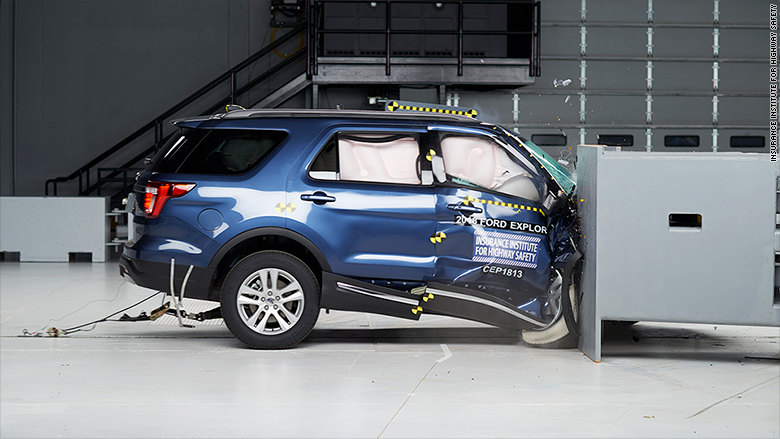 The Jeep Grand Cherokee and Ford Explorer were among eight SUVs the Insurance Institute for Highway Safety recently subjected to its small overlap front crash test, which mimics a particularly violent and dangerous type of collision. They were the only ones to earn the rating of "poor," the worst of four possible ratings. In the test, a vehicle is propelled at 40 miles an hour and strikes a barrier with just the outermost part of the bumper on the passenger's side. It is designed to mimic the impact of a vehicle with another car or a tree or pole with just the outer part of the bumper. The Explorer's door frame was crushed inward during the impact by more than a foot in some places. The Insurance Institute found that injuries to the right hip were very likely, while lower leg injuries were also possible based on readings taken from the crash test dummy. The Ford Explorer earned the lowest possble rating in the Insurance Institute's small ovelap test. 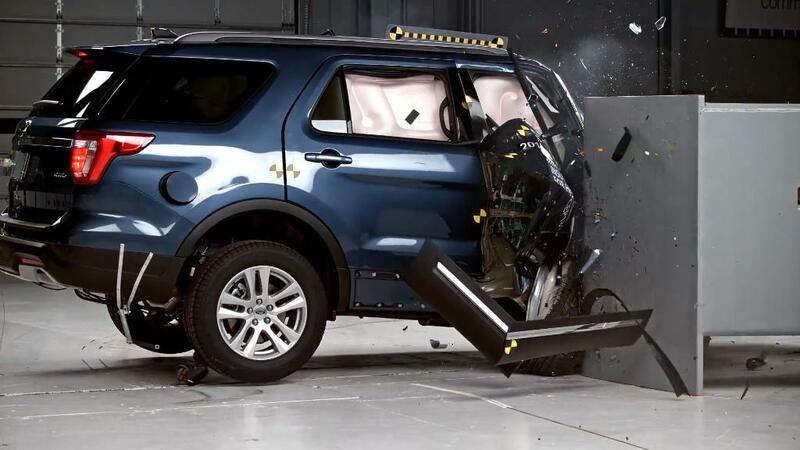 In an email, Ford (F) said that the Explorer is safe, and has earned top scores in all other crash tests. The automaker added that a new version of the Explorer will go on sale next year, and that it expects that car will earn top scores in all Insurance Institute and government crash tests, including the small overlap test. The occupant compartment on the Grand Cherokee was also crushed inward in the test. The crash test dummy's head sunk into the front airbag so far that it hit the dashboard. Also, the side airbag failed to deploy while driver's side door also opened. That allowed the dummy's head to move outside the vehicle. Leg injuries were seen as likely and head injuries possible. "All FCA (FCAU) US vehicles meet or exceed federal safety standards," said Fiat Chrysler Automobiles, which makes Jeeps, in a statement. "FCA US vehicles are engineered to address real-world driving situations. No single test measures overall vehicle safety." Both the Explorer and Grand Cherokee earned a rating of "marginal," the second worst rating possible, when the same crash test was performed on the driver's side of the vehicle. In the same test, the Kia Sorento, Volkswagen Atlas and GMC Acadia all earned the best possible rating of "good." Three other SUVS, the Toyota Highlander, Nissan Pathfinder and Honda Pilot, earned "acceptable" ratings. Correction: An earlier version of this story misstated which side of the vehicle the test was conducted on.